Algarve Housing like to present to you! Just new on our books, a beach house near Lagos. Located in a cul-du-sac, minutes away from the largest beach of the Algarve, Meia Praia. Large spacious lounge (120m2) with terrace with table and chairs, with Ocean views. Last minute introduction price: 2650/ week for August. Please contact me for any more details regarding this Beach House Lagos, more information and pictures. Already booked your dream holiday villa? Algarve Housing has a few nice villas new on their books! A nice variety of some luxury villas, others with private tennis court, or near the West coast and even one without pool, but so nice!! (and cheap! )Haven’t you made your holiday plans? Have a look and maybe one of the villas is your dream holiday villa?! Please contact me for any more details! Of course we have much more dream villas, check our website! Casa Caremujeira is a lovely villa in the countryside, but only minutes from beaches and lively Carvoeiro. Secluded, green, peaceful garden, large, heated pool. Inside, cosy and homey feeling, modern kitchen. Casa Pera is a top luxury villa, with lots of extras, like a 5 star outdoor and indoor kitchen, super private pool, with jet stream, jacuzzi, and bar in the pool, underwater music system. Spoil yourself with this holiday villa, worth it! Casa Sagres is super cool! Walking distance to the beach, private tennis court, large biological pool, plus ‘normal’ pool and trampoline. Close to most and best surf beaches of the Algarve. Casa Sesmarias is a luxury villa, located central Algarve, close to beaches, bars, and restaurants, lively Carvoeiro, and picturesque Ferragudo, local shop and bar. Lovely place to stay. Luxury villa Monte Alvor with a stunning garden and pool (heating option), secluded, lit at night and private with children’s playground, pool table and nice outdoor terraces. Close to amenities. 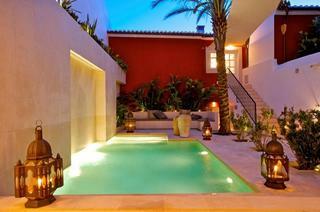 Casa Alfanzina walking distance to the beach and the centre of Carvoeiro. Nice, peaceful, private garden, with (heated) pool. Location, location, location…..
Casa da Praia is a nice town house, walking distance to the beach and the centre of charming fisherman’s village Ferragudo. Nice, peaceful, private garden, close to praia grande, where you find nice beach bars/restaurants and live music! 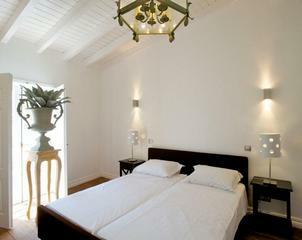 Algarve Housing has another nice villa to rent in the Algarve, a Town House in Lagos! Casa Urbano, Lagos, is a striking modern conversion of a traditional town house, creating luxurious and stylish accommodation, together with a private swimming pool. This holiday property is situated in a winding street in the historic centre of Lagos, complete with an integral garage. Lagos is a unique jewel of the Algarve, and has numerous beautiful beaches, all within easy reach of your holiday villa. The villa, completed in 2008, was accomplished by a well-known design company located in the Algarve. 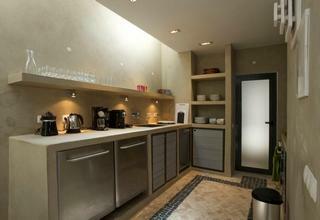 They used polished, limestone flooring, waxed, polished walls and high quality, contemporary fittings in the kitchen. The courtyard to the rear of the house is paved with limestone and planted with a palm tree and exotic plants. Walk into the azure waters of the pool, reminiscent a Roman bath. From your holiday villa you walk into the centre of Lagos, within a couple of minutes, which offers a balance of charm and history of the Portuguese culture with a blend of creature comforts and facilities to please your desires. Open lounge area with built in fire place, sat. TV, DVD, I Pod and Radio. The Open kitchen is well equipped and has nice dining area. Kitchen has among others an electric hob, fridge, freezer, dish washer and oven. The first floor has two spacious twin bedrooms with shared bathroom with shower. With a separate entrance from the court yard, you get to the third, en-suite bedroom with twin beds, and bath. Although you are in the centre of Lagos, Casa Urbano has a nice and peaceful atmosphere, where you can relax and enjoy your Holiday in Portugal. The warmth of Lagos and her people make it difficult to resist falling in love with this seaside town. An ideal place for family, surfing and golf holidays. For more information, pictures, prices and availability, I would invite you to our website. You always can contact me for any question regarding this beautiful Town House in Lagos. If you do not want to miss out of any of the information we publish on our blog regarding New Villas to rent, Special Offers, What’s on Guide of the Algarve and information about the Algarve, please subscribe to our blog!